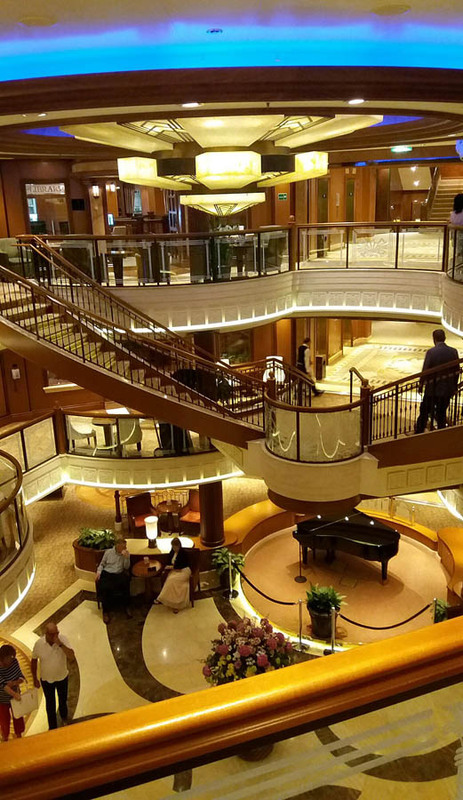 Being just back from a delightful short cruise break to Rotterdam, between weddings, on Cunard’s newest luxury liner the Queen Elizabeth, I thought I’d share a few photos with you. 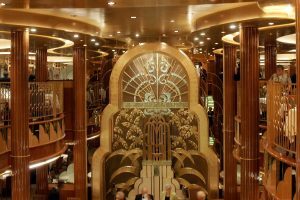 My mini feature focuses mainly on the ship’s internal architecture, fixtures and fittings. 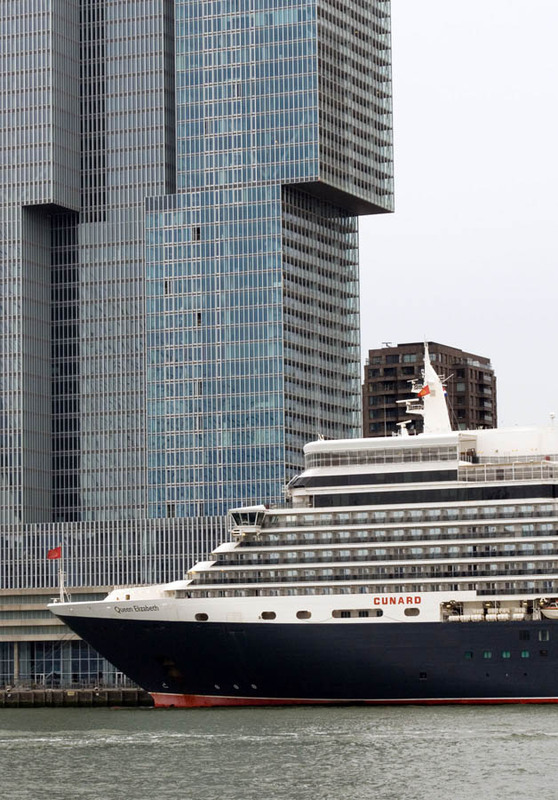 Thoroughly modern liner, looking comfortable next to Rotterdam’s towerblocks. 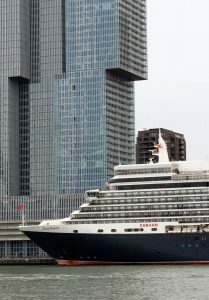 Indeed, some might say that the exterior is more likened to a modern block of flats than a stylish passenger ship; but that’s probably just me being a traditionalist.Launched in 2010 it is the third of the fleet after flagship Queen Mary 2 and Queen Victoria. The ship’s focal point is the lobby. 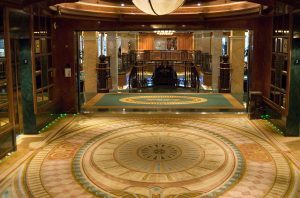 If first impressions are anything to go by then surely when this is your first view of the inside of the ship on boarding, then the grand lobby which in the centre of the ship, covering three decks via sweeping staircases and stunning lighting. 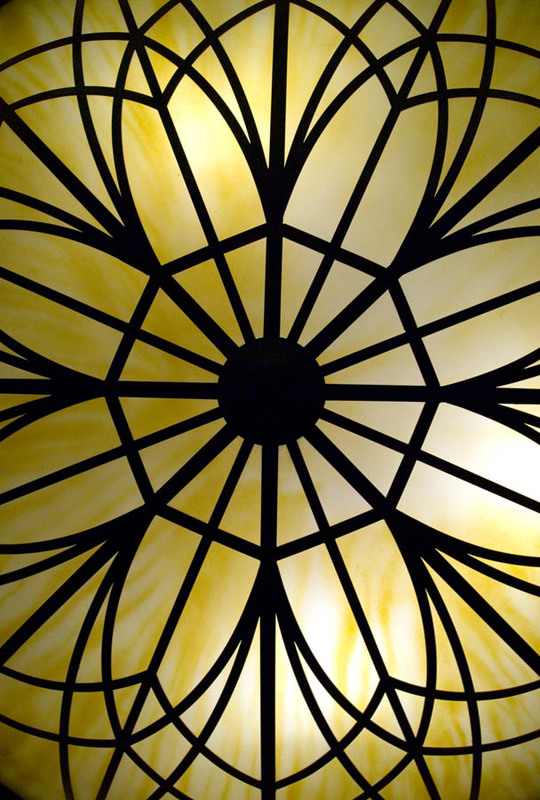 And how’s that for a light fitting? 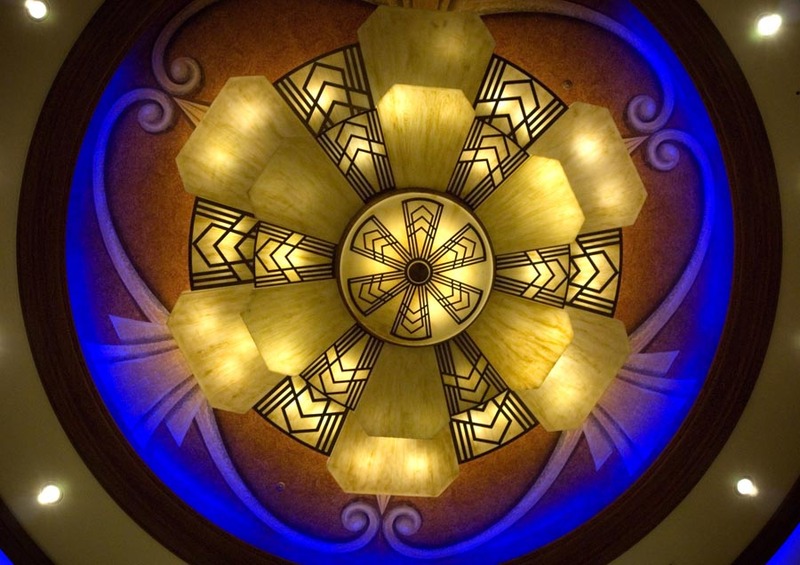 !… My shot looked straight up to this vast distinctly deco style lighting feature above the grand lobby. 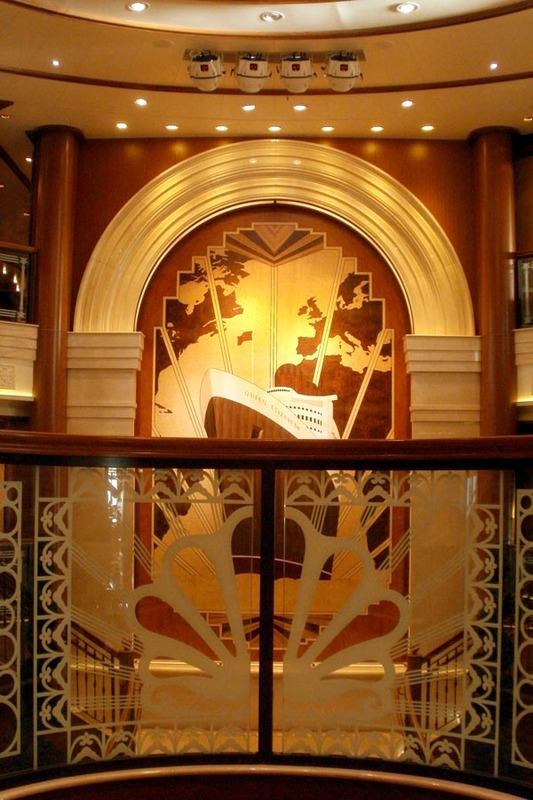 One of the things I love about the interior design of this particular ship is the ‘vintage’ flavour reflecting from the original and very popular mid 1930s Clydeside-built Queen Elizabeth, which survived into the early 1970s. 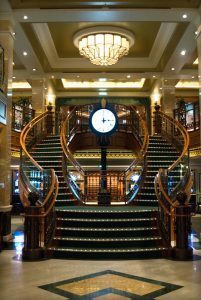 Another architectural highlight on the Queen Elizabeth is the recreation of the famous Titanic staircase, complete with clock. The only slightly unfortunate addition (that I managed to crop out of my shot) was the surrounding slot machines! From a technical perspective, snapping the iconic clock-face was a tough call, as it was so brightly lit, surrounded by more subdues lighting. The hindsight two shots of different exposures sandwiched together would have been a solution. The very grand Britannia Restaurant. 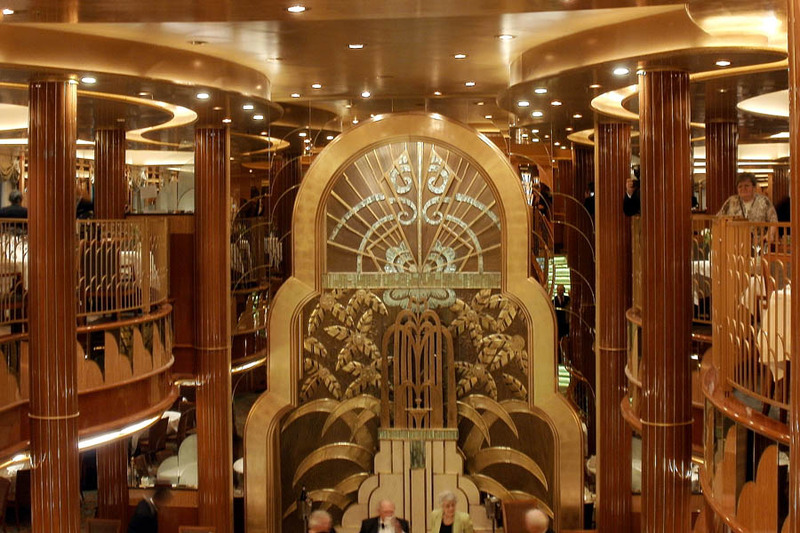 For sheer opulence and art deco grandeur, head to the vast Britannia Restaurant right at the back of the ship. 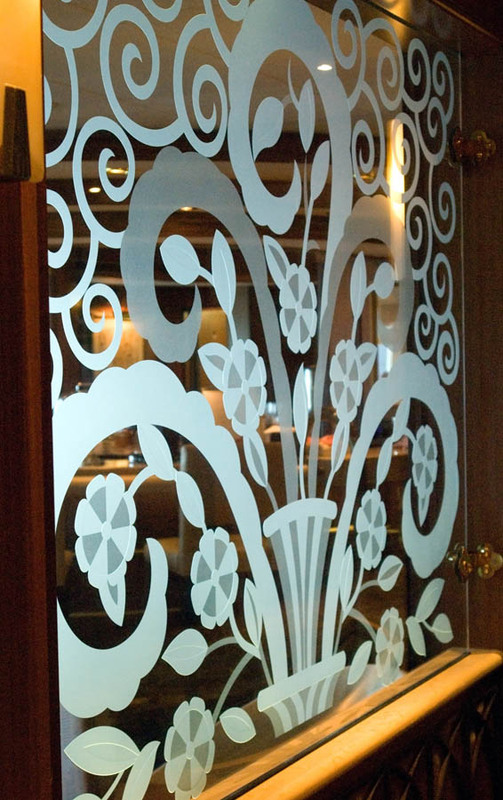 Covering two decks and occupying the ship’s full width, it’s a great dining place. Throughout, the theme is ‘warm vintage tones’ (ie it’s not a light balance issue!). 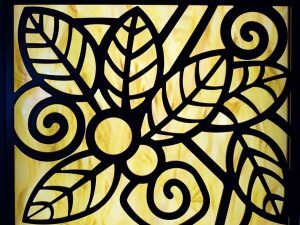 Little details like this a a delight to photograph and with the light glowing through silhouetted metalwork, it looks nice. Ironwork on the staircases create some lovely shadows and are worth a snap too, as does some of the lovely etched glass panels that are a feature on the Queen Elizabeth, that I admire. To photograph the latter, the angle is important so that the light catches on it and the background a consideration, as it needed to be blurred and preferably without people (not always easy on a busy ship carrying over 2,000 passengers). 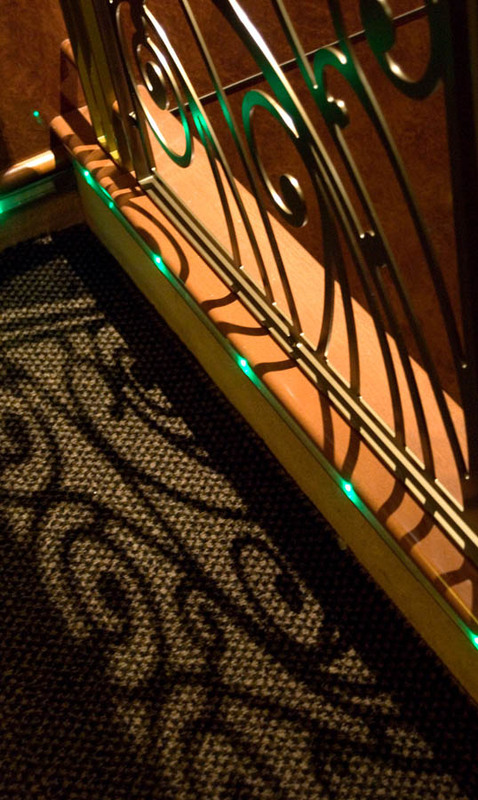 I was really drawn to photographing the very striking and photogenic lighting on board. The Queen’s Ballroom in action! Let’s take a peek next in the very decadent Queen’s Ballroom, dominated by two huge crystal chandeliers. 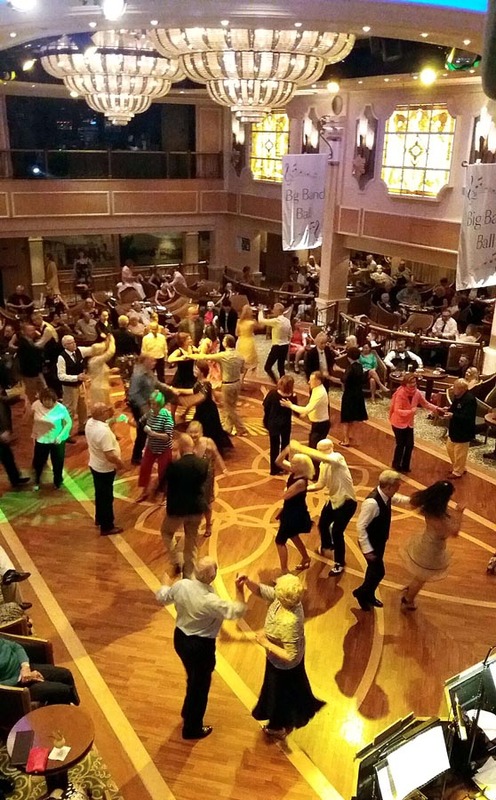 On this occasion I wanted to show it off to it’s potential and snapped the dance floor during the Big Band night. Sorry I can’t include sound, but I’m sure you can use your imagination! 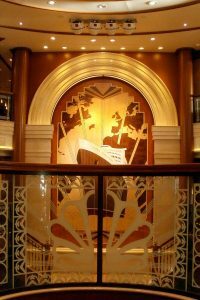 Back in the ship’s Grand Lobby, the beautifully styled marquetry sculpture of the original Queen Elizabeth stands proud on the landing welcoming passers by with a reminder of a liner of the past. Not bad for a corridor! 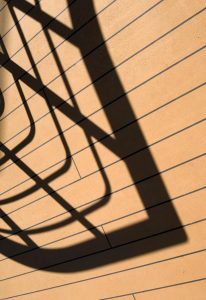 Not wishing to neglect the deck, this lovely shadow (left) captured my attention, as the angle reminded me a little of the bow of a great ship. Whilst waiting for a lift to arrive, I thought to myself this was a pretty nice area to stand around in, as I soaked in the beauty of my surrounds. 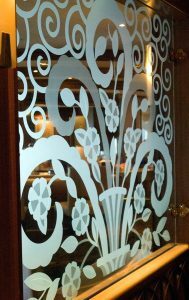 I hope you have enjoyed my brief tour inside Cunard’s Queen Elizabeth. 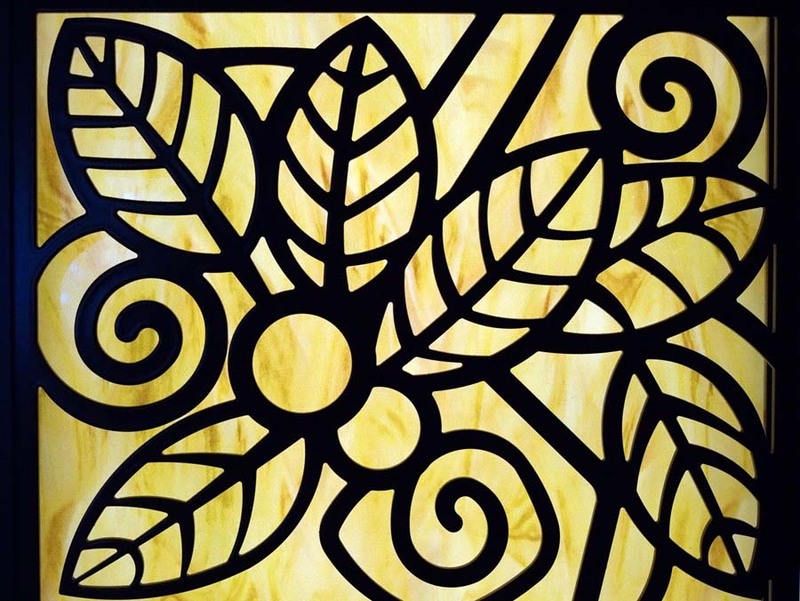 If you’re looking for something extra special, then I do recommend considering a cruise. 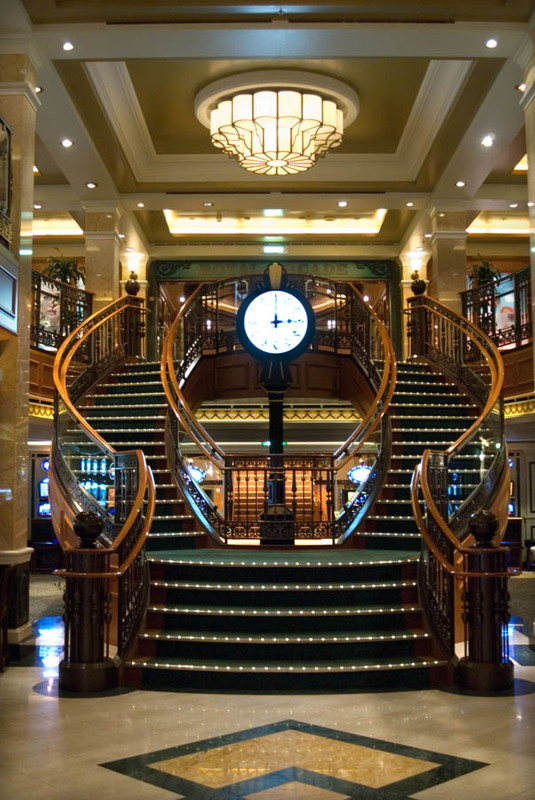 I can’t speak for other cruise lines, but Cunard must be hard to beat.